This easy green bean casserole recipe is my family’s version of the classic recipe and uses only 3 ingredients, including canned green beans… Because who needs another complicated Thanksgiving recipe? NOT this mama! Growing up, our Thanksgiving dinner was never complete without a heaping helping of this easy green bean casserole. Well, this along with my beloved cream corn casserole and layered cranberry salad. So after moving out on my own, I found it both surprising and puzzling that so many of my friends turned their noses up at it. What the heck?! As I was making it to share with you all yesterday, I thought it might be fun to do a quick, informal survey about it on Facebook. It turns out green bean casserole is a highly polarizing topic. But the consensus is pretty much this: love it or hate it, green bean casserole is a holiday dinner staple! After thinking about it some more, I realized something… My mom’s green bean casserole recipe is not your average Campbell’s green bean casserole or French’s green bean casserole. No, it’s not a completely from scratch, homemade green bean casserole, either. What it is, is a stripped down version that’s still super flavorful but can be prepped in just three minutes. I’m not sure how or where it originated, but with just THREE ingredients, it’s FAR easier to throw together than most other recipes. Plus, I personally think it tastes great without the fussy extras that many recipes incorporate. Worcestershire sauce — who needs it? Salt and pepper? Nah, there’s plenty of flavor without it, thanks to the salt used in canning the green beans. And for sure, I don’t add milk. Runny green bean casserole is the WORST! Yep, this easy green bean casserole recipe calls for just canned green beans, cream of mushroom soup, and French fried onions. That’s it! These three simple ingredients combine to make a thick and creamy casserole (with a bit of crunch) that’s pure comfort food. A quick note on finding the French fried onions — this time of year it’s pretty simple. Around Thanksgiving, most grocery stores have them on the aisle end caps, along with the cream of mushroom soup and green beans (on sale!). But if you’re hunting for them outside of the holidays, it’s not so intuitive. Look for them near the canned green beans throughout the rest of the year, usually on a shelf just above or beside them. Making this simple green bean casserole is incredibly easy. Just mix everything together, reserving about 1/3 of the French fried onions to garnish the casserole at the end. Bake for about 45 minutes or until it’s bubbly and warmed through, and then sprinkle the remaining fried onions over the top. Pop it back in the oven for about 5 minutes to give them a little color, and it’s ready to serve. See?! In fact, the hardest part is making sure the reserved French fried onions aren’t devoured by hungry children… Okay, okay — I’ll admit I’ve been known to sneak a few too. Love them! When you have a ton of other holiday recipes to make, you really can’t beat a good mix, heat, and serve dish like this. And who knows? 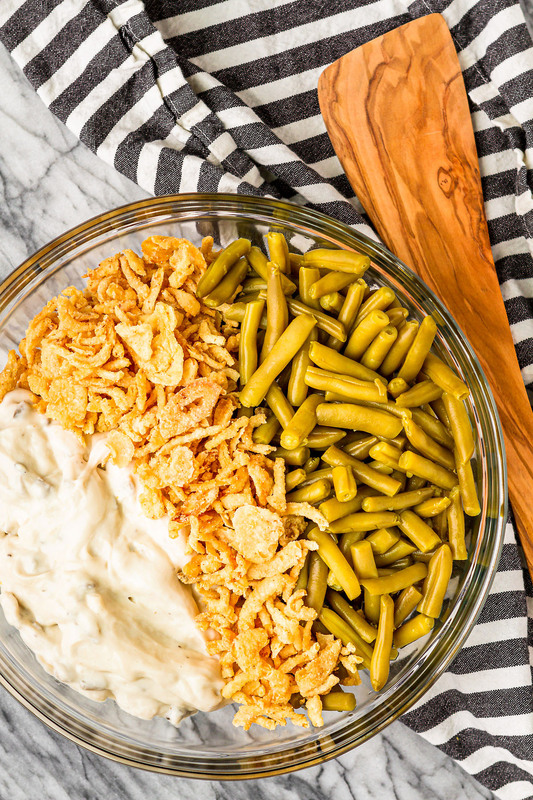 You might even convince a few green bean casserole haters to flip sides when they get a good taste of this delicious creamy/crunchy combo! PIN IT NOW! 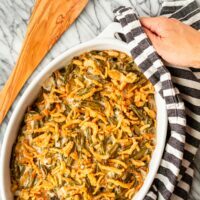 CLICK HERE TO ADD THIS EASY GREEN BEAN CASSEROLE RECIPE TO YOUR SIDE DISHES RECIPES BOARD ON PINTEREST! This easy green bean casserole is my family’s version of the classic recipe and uses only 3 ingredients, including canned green beans… Because who needs another complicated Thanksgiving recipe? NOT this mama! Drain the green beans, and mix them together with the cream of mushroom soup and about 2/3 of the can of French fried onions. Transfer to either a 9"x9" square baking dish or an 11" oval baking dish. Bake uncovered at 350 degrees for about 45 minutes, until bubbling. Top with the remaining French fried onions and bake for an additional 5 minutes, until the French fried onions are golden brown. 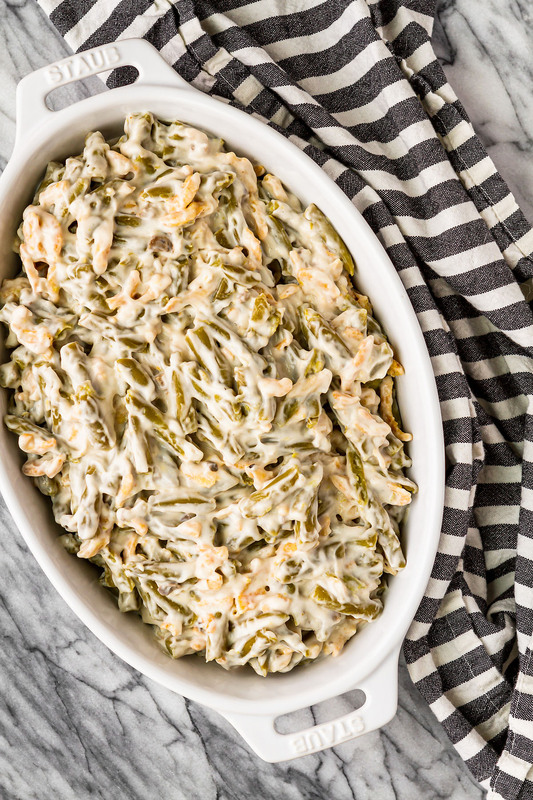 This easy green bean casserole can also be prepared in your slow cooker. Simple mix everything up in your slow cooker insert and cook on low for 4-5 hours or high for 3-4 hours, or until heated through. If you want to brown the fried onions for the topping, toss them in a skillet over medium heat for about 5 minutes. This easy tuna casserole with egg noodles was always one of my mom’s go-to recipes when I was growing up… And I can totally see why. Tuna noodle casserole is quick to prep, tasty, and versatile! This custardy cream corn casserole recipe is SO good you’ll want to scrape the dish clean to get every last bit of caramelized goodness… My favorite of all the corn casserole recipes I’ve tried, just like my grandma made it! This easy cheesy meatball casserole boasts just 5 ingredients, yet is still packed with flavor… Serve it as is, over pasta, or on sandwich rolls for a versatile weeknight dinner! Need to save some space in your oven? This simple green bean casserole can also be prepared in your slow cooker. Simply mix everything up in your slow cooker insert, and cook it on low for 4-5 hours or high for 3-4 hours, or until heated through. Easy-peasy! The only downside is you can’t brown the fried onions like you do in the oven-baked version. No problem, though! Toss the remaining fried onions in a skillet, and brown them over medium heat for about five minutes. Sprinkle them over the top of your slow cooker green bean casserole, and you’re good to go. I’d love to see how your green bean casserole turns out… Tag me @Unsophisticook on Instagram or use the hashtag #Unsophisticook so I can check it out. Enjoy! 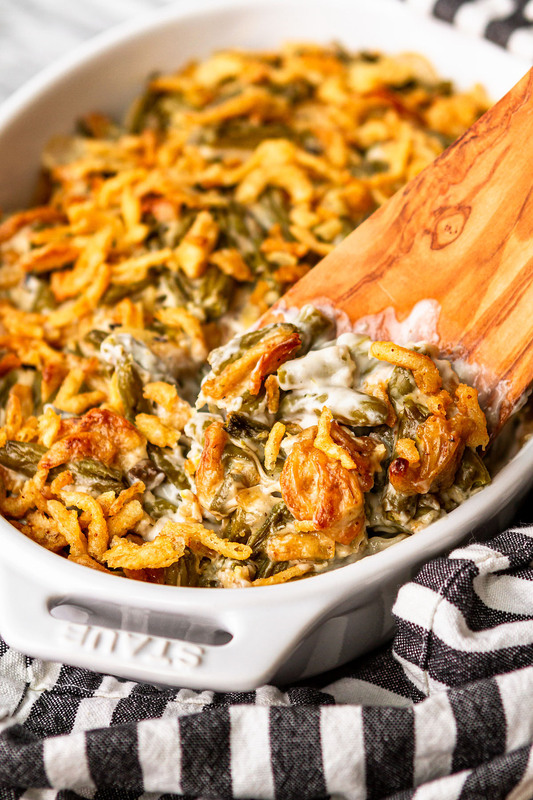 So tell me how YOU feel about green bean casserole — love it or hate it?!? I made this green bean casserole as practice for Thanksgiving and it was AWESOME! Thanks for the recipe! So happy to hear that, Jacqui — enjoy your Thanksgiving! A seasonal classic that never goes out of style! My family loves this! I love green bean casserole. However, I like to use fresh green beans. I imagine/hope it should come out just as good. I love the added crispy onions on top. This recipe is a classic and so good. 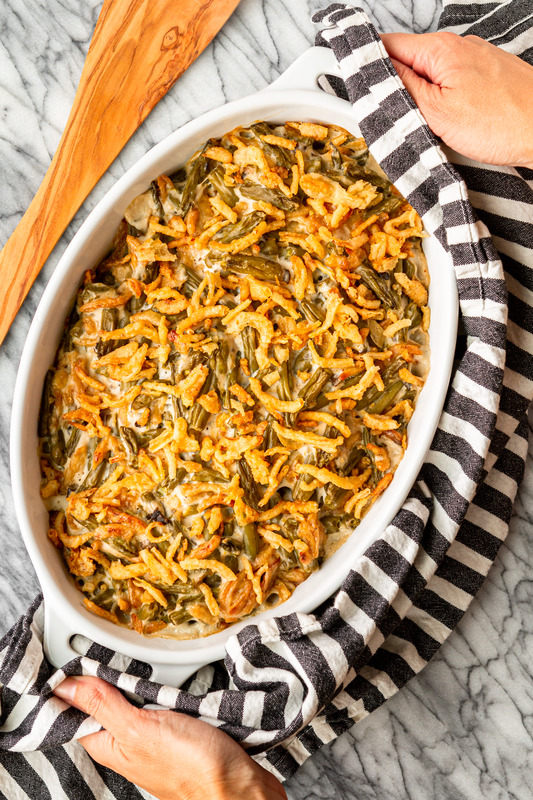 I’m a sucker for green bean casserole – so excited for Thanksgiving! Just like I like it, super easy and delish!! 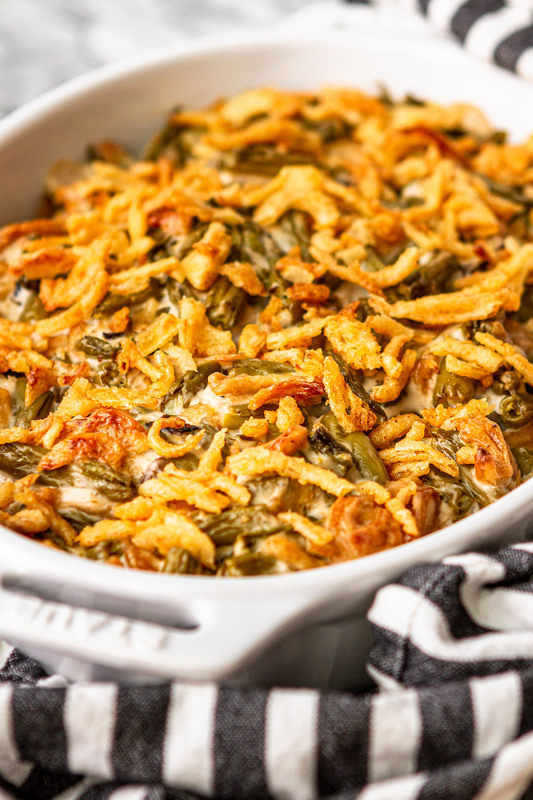 I’ve never been a huge fan of green bean casserole but yours looks so good, I have to try it! I can’t believe there are only three ingredients! Yum! This looks so easy and delicious! LOVE that it only has 3 ingredients! Can I prepare it for the night b4? Hi Liz! You can — but I’m not sure how much time you’ll really save. In fact, it will probably take longer to cook when it’s cold. It literally takes 3 minutes to mix it up and pop it in the oven, so I’d say just making it the day of is your best bet. My family loved it. My son wants it way more often than just holidays. And it couldn’t be easier! Thanks! I had never made green bean casserole before, but being an extremely lazy cook, I decided to give this recipe a try. My adult son absolutely LOVED it. I had to make it 3 times for him before I told him to go home and cook it for himself. I loved it too. I predict a shortage of French’s french fried onions by next year. We’re already stocking up for Christmas. Thanks so much! Oh my gosh, I can’t believe I didn’t specify that, but yes, the green beans should be drained. I’m SO sorry! Going to update the recipe to make that clear now. The only thing we do at this house to make it better is to add Golden Mushroom soup instead of the cream of Mushroom soup………..Sooooo Good ! I will definitely try that — thanks for sharing! Make this every year for our family Thanksgiving pot luck. Will definitely try with this soup instead. I do not like green bean casserole, mainly because I can’t stomach mushroom soup. There are 2 ways to make good green beans. First and easiest, just cook with butter, salt and pepper. Second, cooked with lots of bacon and onions. The first time I opened a can of mushroom soup, I nearly gagged from the smell. I can always tell when someone cooks with it, it has that distinctive smell, similar to a wet dog. Yuck! lThis is my kind of casserole! I love green beans and ff onion rings and this is so easy. The world needs more recipes this simple and good.